"Build his statue to make him glorious." The Catherine and Robert Pedersen Shakespeare Character Garden, featuring some of Shakespeare’s most famous lovers, warriors, kings, and scoundrels, is a quiet place for contemplation, reading, and leaving the cares of the world behind. The garden includes several benches, various flowers and shrubs, as well as nearly twenty varieties of trees. It is located between the Engelstad Shakespeare and Randall L. Jones Theatres. 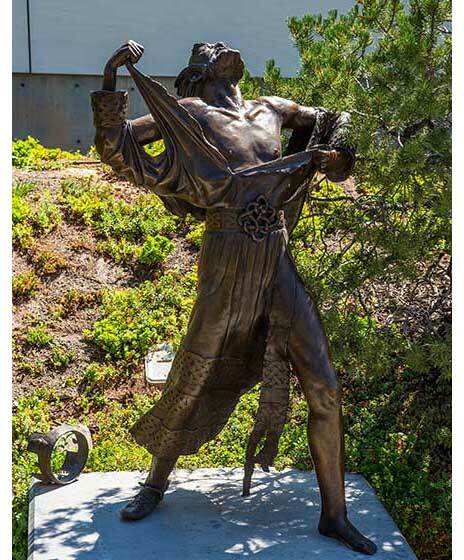 Catherine and Robert Pedersen, long-time lovers of the Utah Shakespeare Festival, were major donors toward the garden. Dedicated to the memory of Lisa Grove-Samuelson, past Festival Board of Governors member and long-time Festival patron. Shakespeare has just laid aside his pen after writing a phrase that has especially pleased him. He contemplates where he can use it, as he surveys the characters that fill his imagination. 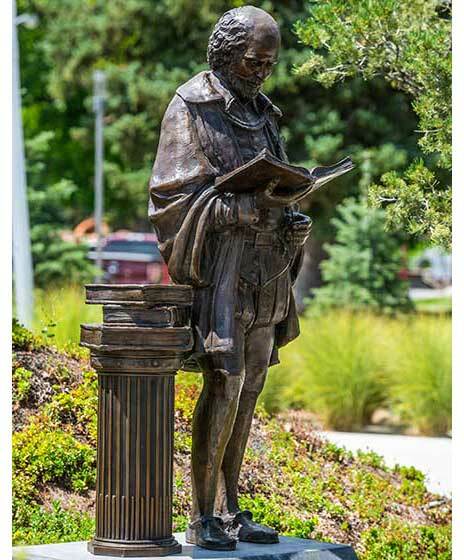 Little known fact: The sculpture includes a popular Shakespeare quote. Though the public cannot see it, the artist carefully crafted these famous lines on the page of the open book: “This above all: to thine own self be true, / And it must follow, as the night the day, / Thou canst not then be false to any man” (Hamlet, 1.3.78-81). The Egyptian queen, surrounded by Roman legions and about to be captured and dragged through the streets of Rome as a trophy, secretly has a poisonous snake smuggled in to her and ends her life with a final victory over the conquering Romans. Little known fact: The actual cartouche (signature) of Cleopatra has been carved on the sides of her throne. Carousing at the Boar’s Head Tavern, Sir John Falstaff seats himself upon a barrel of sack, and with a pillow for a crown and a mop for a scepter, he instructs young Prince Hal in how to be a king. Little known fact: Modeled after Robert Machray, who played Falstaff at the Festival in 1992, the statue was planned to be part of a fountain, with water gushing from the broken cask and dripping from Falstaff’s mug. Arriving home in Denmark, Prince Hamlet and his friend see a grave being prepared for a funeral. As the gravediggers work, they toss up from an earlier grave Hamlet’s father’s court jester, which floods the prince with memories. Little known fact: Stan Watts used Brian Vaughn’s face as the model as a tribute to the actor’s portrayal of Hamlet in 2006. With only a handful of loyal English soldiers and facing a vast French foe, King Henry inspires his soldiers to a great victory with one of Shakespeare’s greatest speeches. Little known fact: Henry’s armor details are correct even down to the etched actual coat of arms of Henry V on the breastplate. Juliet was the first bronze to be cast for the garden. Its size and special requirements set the standard for the rest of the collection. Juliet has just stepped out onto her balcony after learning that the young man that has so captured her fancy is no other than the only son of the hated Montague family, her family’s arch enemies. Speaking to the stars, she pours out her heart in one of the world’s most famous soliloquies. Little known fact: The face and hair of Juliet were modeled after Fred C. Adams’s daughter, Dorcas Elizabeth. Conscious stricken by her role in the murder of King Duncan, Lady Macbeth walks the castle corridors plagued by the smell of blood and the visions of the slaughtered king. Little known fact: The candle being held by the sleepwalking queen is patterned after the original beeswax candles used by royalty in Scotland in the fourteenth century. “Blow, winds, and crack your cheeks! rage, blow! Driven to madness by his two evil daughters, King Lear tears his clothing and runs out into the storm, calling down God’s vengeance upon his unfeeling daughters. Little known fact: King Lear was modeled after the noted Hollywood actor Harold Gould, who played the king at the Festival in 1992. When Titania, queen of the fairies, meets Oberon, king of shadows, in the forest, he chides his lover for supposed spites. Little known fact: Titania was designed to reside in the garden perched atop the center berm, but was temporarily placed at the entrance to the Randall L. Jones Theatre. She was so perfectly situated there greeting guests that it was decided to not move her to the garden. To see her, go to the west entrance of the Randall Theatre.